HA NOI (VNS) — Viet Nam must win a match against Chinese Taipei on September 8 to hold onto hope of winning a berth at the World Cup 2018. Coach Toshiya Miura and his team will arrive in Taipei today and will have three days to prepare for the second Group F round match of the 2018 FIFA World Cup/2019 AFC Asian Cup joint-qualifiers. Yesterday, all 23 players proved they were in top form with a mandatory medical test assigned by their Japanese coach. He asked his players to focus completely on the match so that Viet Nam can compete well against Iraq and Thailand, two of its stronger rivals in the group, who also want to secure the top position. However, he said, beating Taipei, who are considered the weakest team, was not an easy job. Football is unpredictable, so if there is no effort and determination, no one can be successful. He advised all players to ensure their fitness level and spirits remained high to target winning three points. Miura spent a lot of time watching Thursday's match between Iraq and Taipei. Iraq scored three times in the final 10 minutes of their opening match, as the 2007 AFC Asian Cup champions kicked off their Group rounds with an assured 5-1 win. Vietnamese players will examine all of their rivals' plays to form a strategy for their matches. During squad selection, Miura encountered several objections when he dropped the national favourite Nguyen Cong Phuong and local top scorer Nguyen Van Thang. Instead, he favoured players with strong interpersonal skills, such as Bui Tien Dung, Do Duy Manh, Tran Phi Son and Hoang Dinh Tung. These players are divided across the three lines of the team. Strikers Son and Tung don't have the ideal athletic form, but they can change the game with unique, unexpected attacks. They will support key strikers Le Cong Vinh and Mac Hong Quan, who are always Miura's No 1 picks. For the defence, the 52-year-old coach has faith in Nguyen Xuan Thanh, Dinh Tien Thanh and Nguyen Huu Dung, his secret weapon. Players showing stable performance, such as Vo Huy Toan, Que Ngoc Hai and Nguyen Thanh Hien, also found a place on the team. 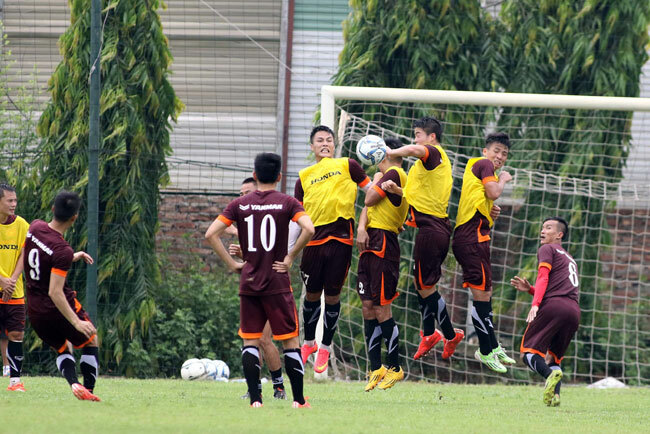 To Vinh Loi, who ended his contract with FLC Thanh Hoa last week, is the No 1 goalkeeper of the team. His substitutes are Tran Nguyen Manh of Song Lam Nghe An and Nguyen Tuan Manh of Sanna Khanh Hoa, who is back with the national team after a three-year absence. Like Viet Nam, the hosts have also announced their list of players, including those who are currently playing abroad. Among them is Xavier Chen, who played for KV Mechelen in Belgium for five years before moving to China's Guizhou Renhe. Midfielder Victor Chou used to be a member of Club Deportivo Salmantino in Spain. Veteran Chen Po-liang is competing for Hangzhou Greentown Club in the Chinese Super League. The match will be aired live on K+ TV and replayed on channel VTV6 from the Municipal Stadium at 6pm. According to Tran Huu Nghia, president of the Viet Nam Football Fan Association, there are many Vietnamese people working and living in Taipei. Some 7,000 of them will attend the match, with many more coming in from Viet Nam to support the national team, waving a huge national flag. In another group match, Iraq faces group leader Thailand, who topped the table following wins over Viet Nam (1-0) and Chinese Taipei (2-0). The group winners and four best runners-up (12 teams in total) will advance to the 2019 AFC Asian Cup finals and the final round of qualifiers for the 2018 FIFA World Cup.